CINCINNATI (AP) Major League Baseball commissioner Rob Manfred will serve as grand marshal for Cincinnati's annual opening day parade as he helps celebrate the 150th anniversary of the professional baseball-pioneering Red Stockings. The Reds announced Tuesday Manfred will lead the 100th Findlay Market parade, which will wind through the city ahead of the March 28 game when the Reds host the Pirates. Reds team historian Greg Rhodes says the Findlay Market merchants' parade grew out of disorganized opening day parades around town by different civic and neighborhood groups. The Associated Press reported Monday that Manfred would be in Cincinnati for opening day festivities as MLB and the Reds commemorate baseball's first openly all-salaried team. 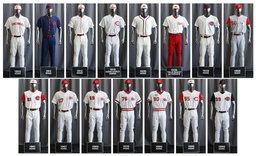 MLB teams will wear patches and the Reds will have special patches, uniforms and events throughout the season.